Hep27 monoclonal (Hep27 Mab) is an antibody against hepatocellular carcinoma. Hep27 Mab itself can inhibit the growth of a hepatocellular carcinoma cell line (HCC-S102). We attempted to produce a single-chain fragment (scFv), a small fragment containing an antigen-binding site of Hep27 Mab, by using DNA-recombinant techniques. The sequences encoding the variable regions of heavy (VH) and light (VL) chains of a murine Hep27 Mab were linked together by a linker peptide (Gly4Ser)3 and tagged with a hexa-histidine at the C-terminal; the resultant DNA construct was expressed in E. coli as an insoluble protein. The denatured scFv was refolded and purified by immobilized metal ion affinity chromatography (12 mg/l with a molecular weight of 27 kDa). Hep27scFv exhibited a tumoricidal activity against the HCC-S102 cell as its parental antibody (Hep27 Mab). This scFv may be a potential candidate for a targeting agent in HCC immunodiagnosis or immunotherapy. Hep27 Mab is a monoclonal antibody raised against a hepatocellular carcinoma cell line (HCC-S102). In a previous study, Hep27 Mab was identified as an anti-oncodevelopmental antigen type (ODA) since it interacted not only with HCC but also with normal fetal and newborn livers. No interaction was observed in normal adult livers. In addition, it reacted with the synthetic carbohydrate antigen of glycolipid containing a mucin core unit. Moreover, as determined by FACS, the binding activity of Hep27 Mab to HCC cells treated with PDMP (1-phenyl-2-decanoylamino-3-morpholino-1-propanol, an inhibitor of glycolipid synthesis) was decreased; indicating that epitope recognized by Hep27 Mab should be a glycolipid. Hep27 Mab alone inhibits the growth of an HCC-S102 cell line (65% viability) without effector cells . The mechanism of tumor suppression is not known exactly, but it may concerns the regulation of tumor cell proliferation by binding Hep27 Mab to the growth factor receptor on the cell. This Mab may be potentially useful for human hepatocellular carcinoma diagnosis and therapy. However, the use of murine monoclonal antibodies for human tumor diagnosis and therapy is limited by the human anti-mouse antibody (HAMA) response. These limitations may be overcome by a genetically engineered single-chain antibody fragment (scFv) lacking an Fc domain . These small scFvs consist of a variable heavy chain (VH) and a variable light chain (VL) linked together by a flexible polypeptide linker . These scFv molecules retain the original antigen-binding site and, therefore, represent valuable molecules for targeted delivery of drugs, toxins, or radioisotopes to a tumor site. Furthermore, scFv can be produced on a large scale in bacteria or yeast [4, 5], and it can be manipulated by genetic engineering to form anti-tumor fusion proteins with additional effector functions [6, 7]. This article reports our work about construction, expression, purification of a single-chain antibody fragment (scFv), and characterization its biological function against a human hepatocellular carcinoma cell line. By using an assembly PCR that is described in the methods section, the fragments of VH and VL were assembled together, yielding a fusion fragment encoding VH-VL with a histidine tag at the C-terminal end (Figure 1B). They then were cloned into the expression vector, pET8C as an NcoI – Bpu1102I fragment. After linker insertion, positive clones consisting of VH-linker-VL were selected and used to perform DNA sequencing. A deduced amino acid sequence of VH and VL connected by a linker peptide, (GGGGS)3, is shown in Figure 2. A construction of scFv. (A): Schematic representation of scFv gene construction using overlapping PCR. The variable regions of heavy chain (VH) and light chain (VL) were amplified separately by the 1st PCR. 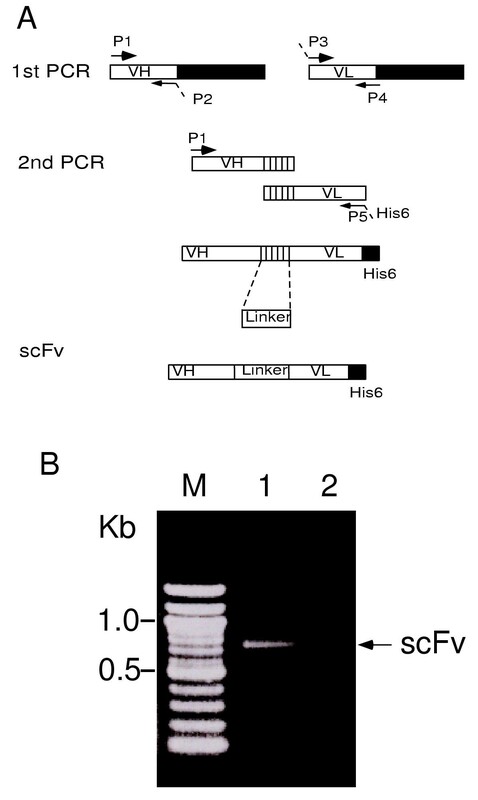 The VH and VL segments were assembled by the second overlap PCR to generate the scFv fragment. (B): Agarose gel analysis of PCR product of scFv. 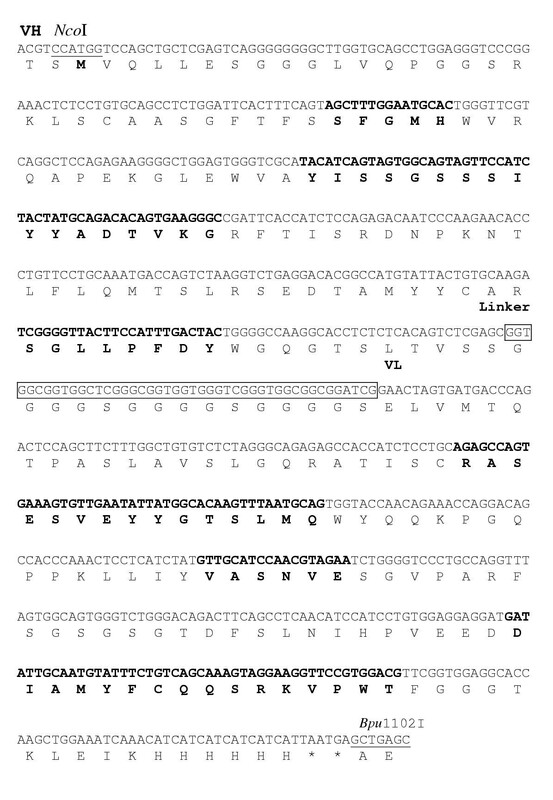 Lane M, DNA marker (100 bp ladder); lane 1, the scFv PCR products; lane 2, negative control (without templates). Nucleotide and deduced amino acid sequences of the constructed Hep27scFv containing V H , linker peptide, and V L . The CDR regions are indicated by bold characters. The linker peptide is marked in box. Underlining indicates the restriction enzyme sites used for cloning the Hep27scFv gene. The over expression of scFv was induced by adding IPTG to the final concentration of 1 mM. The total cells, including both soluble and insoluble fractions, were analyzed by SDS-PAGE and immunoblotting. As shown in Figure 3, an scFv-His fusion protein of about 27 kDa was strongly expressed. The results showed that most of the scFv was expressed as insoluble inclusion bodies. The scFv could not be detected in a soluble fraction or in a culture medium. Without IPTG induction, no scFv was detected even in a whole cell fraction. Protein fractionation analysis of scFv. (A): 12% SDS-PAGE of the gel was stained with 0.25% Coomassie Brilliant Blue R-250. (B): Western blot. A fusion protein was probed with mouse anti-His Ab, followed by goat anti-mouse alkaline phosphatase conjugated Ab. Color was developed by using NBT/BCIP alkaline phosphatase substrate. Lane M, protein molecular weight marker; lane 1, total cells sample (without IPTG induction); lane 2, total cells sample (under IPTG induction) ; lane 3, culture supernatant; lane 4, insoluble fraction; lane 5, soluble fraction. The scFv (27 kD) is denoted by an arrow. 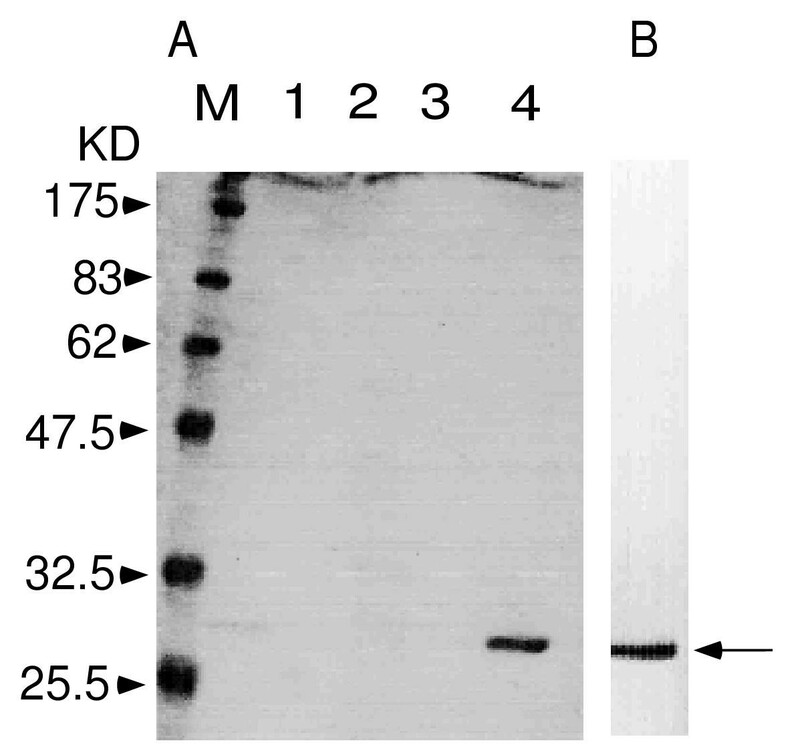 The purified Hep27scFv was analyzed by SDS-PAGE (Figure 4A) and immunoblotting (Figure 4B). The scFv appeared as a single homogenous 27-kDa band. For this experiment, a purified scFv yielded 12 mg/l of E. coli cell culture. We analyzed the molecular weight of purified scFv by using a superdex 75 column and comparing the results to standard molecules. As seen in Figure 5, the isolated scFv consisted mainly of a monomeric structure (approximately 27 kDa) and small amounts of aggregated scFv. SDS-PAGE and immunoblotting analysis of putified scFv. (A); SDS-PAGE stained with CBB. Lane M, protein molecular weight marker; lane 1, soluble proteins after refolding; lane 2, Flow-through fraction; lane 3, washed fraction; lane 4, eluted fraction. (B): Immunoblotting of purified Hep27scFv stained with mouse anti-His antibody (IgG) and alkaline phosphatase-conjugated anti-mouse IgG. Relative molecular mass (kDa) of standard proteins is shown on the left. Gel filtration profiles. Gel filtration of purified and refolded Hep27scFv was performed on Superdex 75 column connected to a FPLC system pre-equilibrated with PBS. Sample volume and flow rate were 200 μl and 0.5 ml/min, respectively. Molecular mass was calibrated with ovalbumin (44 kDa), myoglobulin (17 kDa), and vitamin B12 (1.35 kDa). In our previous study , we found that the viability of HCC-S102 cells was reduced to 85 %, 83 % and 65 % on the first, second, and third day, respectively, after treatment with 5 μg/ml of Hep27 Mab. No significant change could be found in negative control (HCC-S102 treated with Hep16 Mab, an Ab secreted from hybridoma clone without tumuricidal activity). To investigate whether a single scFv can inhibit tumor cell growth, we treated HCC-S102 with various concentrations of Hep27scFv. The relative numbers of viable cells were then determined; the results are shown in Figure 6. Dose-dependent cytotoxic effects were observed. The HCC-S102 cell proliferation rate was reduced to 68% when the cells were treated with 20 μg/ml of Hep27scFv for 72 h, but it was not changed in negative control (0 μg/ml Hep27scFv). Moreover, anti-KOD DNA polymerase scFv (βG1scFv) at a concentration of 0–20 μg/ml also was used as a negative control. The results showed that cancer cell proliferation could not be reduced. This experiment indicated that a refolded and purified Hep27scFv retained a tumoricidal activity against HCC-S102 as its parental antibody, Hep27 Mab. The effect of Hep27scFv on HCC-S102 cell growth in vitro. HCC-S102 cells were incubated with various concentrations of Hep27scFv for 72 h. Cell proliferation rate was assayed by the MTS method and calculated as described in the methods section. Cell proliferation rate reduced after treatment with various concentrations of scFv in a dose-dependent manner. The rate reduced to 68% with 20 μg/ml of Hep27scFv incubation but did not change either in negative control (0 μg/ml scFv) or in cells treated with βG1scFv. It has been confirmed that Hep27 Mab recognized a tumor antigen on HCC-S102. Hep27 Mab showed no reactivity to normal liver and low binding activity to HCC-S102 treated with PDMP, an inhibitor of glycolipid synthesis. Furthermore, Hep27 Mab alone can inhibit tumor cell growth . However, murine antibodies, as foreign proteins, may elicit immune reactions that reduce or eliminate their therapeutic efficacy and/or evoke allergic or hypersensitivity reactions in patients. Therefore, we attempted to produce Hep27scFv that may be useful in the immunodiagnosis and immunotherapy of HCC. In this study, we constructed a single-chain antibody fragment, Hep27scFv. It consisted of the variable domains of the heavy (VH) and light (VL) chains. The two variable domains are linked via a flexible peptide, (GGGGS)3, to improve the stability of the Fv domains. A variety of linkers with different lengths and sequences has been used [3, 8–10]. Previous studies indicated that the lengths and sequences of the linker peptide could significantly affect the properties of scFvs [11–14]. A short linker (0–10 residues) hinders dimerization . The most widely used linker designs have sequences consisting primarily of stretches of glycine (G) and serine (S) residues. Hydrophilic properties of serine allow hydrogen bonding to the solvent, and glycines provide the necessary flexibility . To facilitate protein purification, the six-histidine residues were fused at the C-terminal of scFv. Most of the scFv proteins were expressed as inclusion bodies that were solubilized in buffer containing 6 M GuHCl and refolded by step-wise dilution of GuHCl to yield 12 mg/l with a molecular weight about 27 kDa. These results were consistent with the theoretical calculations. However, the gel filtration profiles of purified Hep27scFv consisted of a monomeric form with a molecular size of 27 kDa and a small amount of non-specific aggregation products that also have been reported by other groups [15–18]. Recently, Kurokawa et al. reported overexpression of eukaryotic proteins containing multiple disulfide bonds by coexpression with Dsb protein [19, 20]. Based on this strategy, it is a challenge to express scFv with disulfide bonds in a soluble form in E. coli, so that scFv may directly be purified, characterized, and employed without a protein refolding step. We are now trying to express an active soluble protein of Hep27scFv by using the Dsb coexpression system. The results of a cell proliferation assay showed that Hep27scFv has the potential to inhibit HCC-S102 cell growth: there was a 32% reduction of cell proliferation rate at a concentration of 20 μg/ml of refolded and purified Hep27scFv. No change was observed in negative control (0 μg/ml Hep27scFv) and the βG1scFv-treated cells, indicating that other types of scFv could not induce HCC-S102 cell growth inhibition. Only Hep27scFv showed an effect on tumor cell growth. These results also imply that in vitro refolding yields a correct conformation of scFv and that an incorrect form of refolded scFv will lead to protein aggregation without biological function. Although the mechanism of cancer cell death mediated by Mab or scFv has not been characterized yet, it may be involved in the binding between Mab or scFv and the growth factor receptor on tumor cells [21–23]. Although we did not study how scFv works on the same cells without tumor antigen such as normal liver tissue, our previous study showed Hep27 Mab reacted against HCC-S102, fetal and newborn livers but not against normal adult livers. In addition, the reactivity of Hep27 Mab against HCC-S102 treated with PDMP, an inhibitor of glycolipid synthesis, was decreased compared to untreated cells . Therefore, we assumed that Hep27scFv consisting of a nucleotide sequence encoding for the variable region of its parental antibody (Hep27 Mab) would not recognize normal liver. In view of our results, an active Hep27scFv could be produced in E. coli with high yield. Primary characterization of the biological activity indicated that Hep27scFv showed a potential tumoricidal activity against the hepatocellular carcinoma cell line (HCC-S102) as its parental antibody (Hep27 Mab). Therefore, it likely that Hep27scFv has the potential to be a useful agent for immunodiagnostic and immunotherapeutic applications against hepatocelllular carcinoma. To generate the scFv, the variable regions of heavy chain and light chain encoding for Hep27 Mab obtained from our previous study  were amplified separately using specific primers. 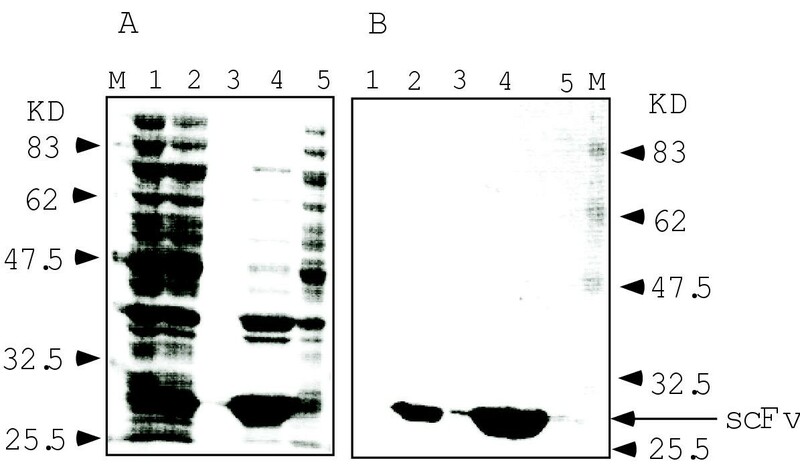 Heavy chain and light chain variable fragments were fused together by using complementary primer for the second PCR. To facilitate the purification step, the 3' end primer of light chain was designed for histidine residues. A negative control experiment was performed without templates. Fusion fragments were then ligated into pET8C. The complementary primer region of VH-VL fusion fragments was then replaced by a linker peptide consisting of three units of Gly4Ser  to obtain a single chain fragment, VH-linker-VL, Hep27scFv (Figure 1). The vector pET8C-Hep27scFv, after being confirmed by DNA sequencing, was transformed into BL21 (DE3). At a mid-log growth phase, the Hep27scFv expression was induced by the addition of isopropyl-β-D-thiogalactopyranoside (IPTG) to a final concentration of 1 mM, and cells were further cultivated for 4 hr. The cells were harvested by centrifugation at 12,000 g and resuspended in 1/2 volume of 30 mM Tris-HCl (pH8.0), 30 mM NaCl. Following the disruption of the cell through sonication, the pellets were dissolved in 1/20 volume of 2% Triton X-100. Then the solution was sonicated and incubated at 4°C for 16 hr. The soluble proteins were solubilized in a Triton X-100 solution, and the pellets (inclusion bodies) were obtained after centrifugation at 14,000 g for 15 min. The insoluble protein was re-natured according to the methods of Tsumoto et al. . Briefly, the pellets were washed twice with a 30 mM Tris-HCl (pH8.0), 30 mM NaCl buffer. They were then solubilized in 50 mM Tris-HCl pH 8.0 containing 6 M Guanidine hydrochoride (GuHCl), 200 mM NaCl, 1 mM EDTA, 10 mM 2-mercaptoethanol (final concentration of scFv = 7.5 μM) and incubated overnight at 4°C. After removal of the mercaptoethanol by dialysis against the same buffer without mercaptoethanol, GuHCl was removed by dialysis against 100 mM Tris-HCl pH8.0 containing 3 M GuHCl and 200 mM NaCl, followed by dialysis against the same buffer with step-wise reduction in the GuHCl concentration (2,1,0.5, and 0 M). Each dialysis was performed overnight. On a 1-M stage, 50-fold molar excess of glutathione (GSSG) and 400 mM L-Arginine were added to the dialysis buffer. After dialysis, the insoluble fraction containing insoluble E. coli proteins and misfolded aggregates scFv was removed by centrifugation at 24,000 g for 30 min and then filtrated before the purification step. For protein purification, soluble proteins were dialyzed against buffer A (0.02 M sodium phosphate buffer, 0.5 M NaCl pH 7.2) and centrifuged before loading into a Cu2+ chelating column (1 ml) that was equilibrated with buffer A. The column was then washed with buffer A containing 25 mM imidazole, and proteins were then eluted with buffer B (0.02 M sodium phosphate buffer, 0.5 M NaCl, 0.5 M imidazole, pH 7.2). To determine the molecular weight of refolded and purified scFv, we performed gel filtration using a Superdex 75 column (Amersham Pharmacia) connected to an FPLC system and pre-equilibrated with PBS. Molecular mass was calibrated with standard proteins of gel filtration (Biorad). 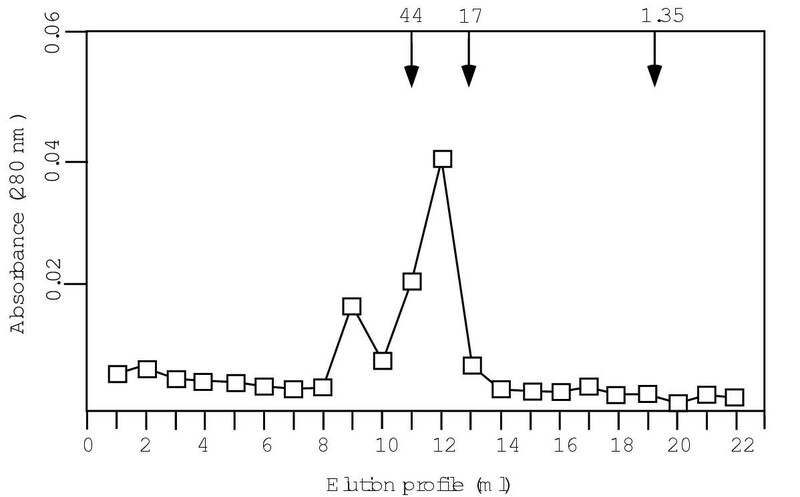 200 μl of refolded and purified Hep27scFv adjusted to 1 mg/ml was subjected to gel filtration at a flow rate of 0.5 ml/min. We thank Dr. Robert B. DiGiovanni (JAIST) for helpful comments and critical readings of the manuscript. This work was supported by a grant from the Science and Technology Incubation Program in Advanced Region by JST (Japan Science and Technology Corporation). DS carried out the molecular genetic studies of scFv, sequence alignment, scFv expression and also drafted the manuscript. ST performed molecular genetic studies of immunoglobulin genes from hybridoma cells. MT (Tsukio) performed biological studies of scFv. TI participated in the design of the study and arrangement of scientific funding. MT (Takagi) conceived of the study, and participated in its design and coordination.